If you love to smoke, grill or cook any type of protein, perfection should be your ultimate goal. Without a meat thermometer for temperature monitoring, you might be treading a journey without destination. And quality BBQ is not just about having a good smoker. To a large extent, it has something to do with Ivation Long Range Wireless Thermometer digital meat thermometer. Ivation has been on the market for quite a long time throughout which customers have applauded its gratifying service. We are also glad to have a digital meat thermometer from the very brand we hold in high esteem. Besides being a reputable brand, we have every reason to testify that indeed wireless thermometer from Ivation works to your fulfillment. We base our conclusion on facts because we care for all the reader needs. Here is what we have to affirm that this long range probe thermometer works. If you have to cook or grill your meat without stress, we believe that this great kitchen appliance should be your companion. Its functioning only confirms the reputation Ivation has had over the recent past. Because we have been trusting kitchen equipment from Ivation, this is no exception. Looking at a wide range of features integrated in this single probe thermometer, we are convinced of the quality service. The features enable high level of functionality while carrying your dreams to fulfillment. Nearly every detail you are looking for is found in this single unit. Why then should you buy a different model? This long range wireless meat thermometer from Ivation comes with a range of amazing features you will definitely approve of. Once you have resolved your puzzle by purchasing the probe thermometer for smoker, you are already in different cooking and grilling world. 300 feet away from your grilling point, you can effectively and efficiently monitor your BBQ. This is courtesy of the wireless feature of the meat thermometer. Details of your ongoing BBQ get displayed on the LCD digital screen, indicated by occasional flashes and beeps. For this reason, you don’t have to get worried of overcooking or under-cooking. Even if you are cooking at night, there’s no problem. The back light makes everything possible and as efficient as daytime cooking. The receiver displays BBQ temperature of up to 572 degrees Fahrenheit. Because most grilling, cooking and smoking fall below this temperature, you have no worries at all managing your BBQ temperature. The food probe wires are convenient enough to be inserted 6-inch into the meat. Regardless of the specific type of meat you are cooking, you can be assured of excellent outcomes. In this particular model, there are two probe wires which can simultaneously monitor two types of food. Both probe wires are heat-resistant to 716 degrees Fahrenheit. This means that with due care accorded to your equipment, possibilities of its damage are reduced to the barest minimum. For this reason, both the smoker and oven are ideal for use with this unit. 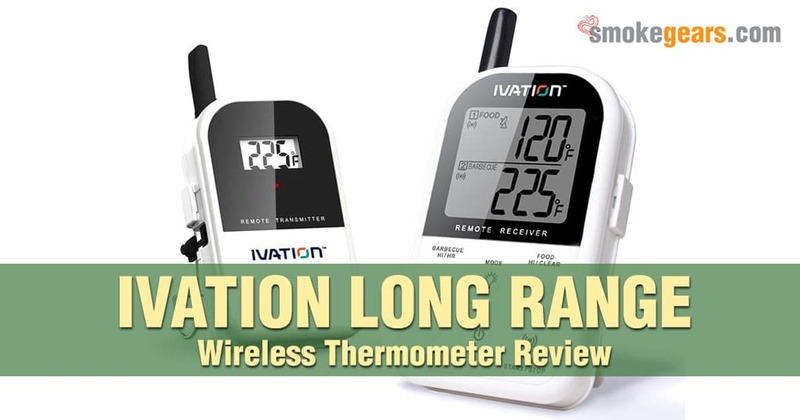 Who is Ivation Long Range Wireless Thermometer for? Step by step, Ivation has attracted a multitude of consumers owing to a number of reasons. Since we have also directly witnessed its beauty understand who this item fits most. If you like grilling and cooking at ago, this unit should be your ultimate choice. In the same way, if your priority is to produce great results, we still recommend this unit to you. Therefore, home-based users with both large and small families can benefit from this kitchen equipment. As long as you desire high quality BBQs, choosing this food thermometer won’t disappoint you. Grilling and cooking professionals as well as smoking enthusiasts are all welcome to purchase and use this wireless unit. Much as everything seems trusted as far as food thermometers are concerned, it is important to think twice. Just as anybody else, we had to suspect this product before finally accepting it. It was until we did our own survey that we came to believe wholeheartedly in this grilling thermometer. Upon purchasing our own probe thermometer, I was most concerned with two things: 300 feet BBQ monitoring distance and 6 inch probe at the end. I thought that if these features actually worked, then the whole unit was perfect. Indeed, after inserting the probe in the deepest part of meat, I deliberately strolled around, strictly monitoring the distance. I followed instructions and was attentive to the LCD displays and beeps. My preset cooking temperature was 275 degrees Fahrenheit. Temperature reading was awesomely instant and that is what my colleagues and other consumers testified too. As normal manmade equipment, strengths and shortcomings are inevitable. It is for this reason that we have dug deeper into the pros and cons of this long range probe thermometer from Ivation. Read on to discover what they are. Has a higher number of reviews compared to most similar products. Assures high quality results since the 6-inch probe at the end can monitor the thickest part of your meat. Is relatively versatile equipment since it can be used in oven or smoker too. Most features increase user convenience such as back light. Relatively higher level of efficiency compared to other similar equipment. Settings are not easily lost even if the unit goes off. The selling price is a great bargain compared to the level of functionality. Perfect design for multiple types of users. The display is smaller compared to Maverick et 733. Limited number of preset temperatures. The settings are fewer than other models. Average rating is lower compared to Maverick ET 733 model. In summary, all your worries and concerns regarding meat and BBQ temperature are covered by Ivation. Its rating is nice generally nice and customers have equally reviewed it positively. If I am undecided on whether to buy this equipment or not, I would choose to buy it. It is now clear, from the reviews that Ivation is trusted and its products are equally functional. To actualize your dream, simply visit Amazon and place an order for Ivation long range wireless thermometer. This is an informed decision for which you will never regret.